← New release: The Ghost Whisperer! So, The Ghost Whisperer ventured into the world this week. After a flurry of rejections last week, things settled down considerably. Well, they settled down to nothing. After last week? I’ll take it. This week, I’ve kept myself occupied with taking a class on The Great Gatsby. I recommend the Jake Gyllenhaal narration via Audible. Even better, if you own the iconic blue cover in Kindle format, that version and the audio one are Whispersynced and you can get a reduced price on the audio. 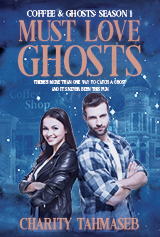 I also revised Gone Ghost and will head straight into revising Must Love Ghosts, just to keep the story continuity in my head. Then? I don’t know. I’m starting to feel the need to go on a writing tear. Episode 3 of the Coffee & Ghosts serial is now available! You can buy or borrow The Ghost Whisperer over at Amazon. Ghost in the Coffee Machine is still free to read and includes an excerpt from the second episode, Giving up the Ghosts. You can read more about what’s up in episode 3 in my post of a few days ago. Oooo!!! I have to read these!!!! Oh, a writing tour would be fun, as would an afternoon floating on the Blue Lady.